Design your garden with African Violets and its cousins, Streptocarpus plants. 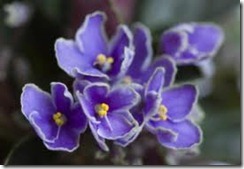 Learn about the African Violet by learning how to take care of it properly. Do an in-depth research on African Violets. -It needs to be in light, but not sunshine. -It needs a lot of grooming and there is a lot of work involved. -Trim it in the same shape of a leaf. -If you notice brown and dried areas, cut them with scissors. -It blooms for a long time. Fix the soil for it. -Use formula 15-15-15 or 12-12-12 of balanced potassium. -Use rotation. ¼ or 1/8 teaspoon of formula to a gallon of water. -Once a month, add half a teaspoon of Epson salts to a gallon of water. -Can use follier feed, but if you start using it, you have to do it all the time. -Never spray plants inside the house. Only spray your plants outside. -Use Neem Oil. It is a natural product from Neem tree in India. -Not more than 1 pot-size water at a time. -Soil should be filled in the pot, up to the pot line. -Use nylon yarn or string or nylon stocking. Tie it to the bottom of the pot. -Put ¼ of perlite in the pot. -Put the plant inside the pot. -Put the premixed soil into the pot, over the plant. -Moisten soil with water. Drinking water is OK, but distilled water is better. -Cousins of the African Violets. 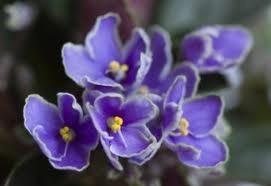 -Mostly similar to African Violets, but slightly different. -Streptocarpus Plants can adapt better than African Violets when they are in similar conditions because Streptocarpus are low maintenance plants and they don’t require too much work. They are more tolerant to humidity and lights as well as require less work.